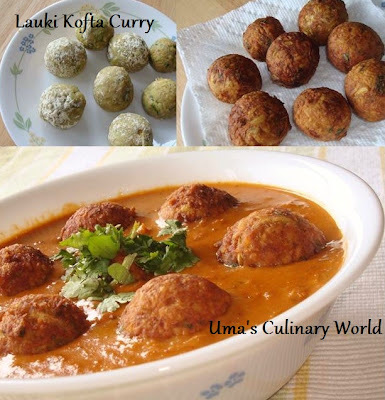 When we talk about Koftas, I am sure most of us love Malai Kofta Curry made of paneer/cottage cheese. I love it too. But preparing koftas of vegetables like bottlegourd, makes me feel less guilty. And these koftas are equally delicious. Peel the bottlegourd skin and discard the seeds. Squeeze out the excess water of grated bottlegourd. Save this water for the gravy/sauce. In a mixing bowl, add bottlegourd, 1/2 tsp coriander powder, 1/2 tsp cumin powder, 1 tsp ginger garlic paste, green chilli paste, finely chopped cilantro, 1/4 tsp garam masala, 1/2 tsp chat masala and salt to taste. Mix all the ingredients well. Add 1/4 cup gram flour to bind all the ingredients. Add more gram flour if required. Divide this kofta mix into 8 round balls. For binding, you can use all purpose flour/maida or bread crumbs or corn meal or boiled potatoes. I prefer protein rich gram flour. In a small plate, add 2 - 3 tbsp gram flour. Coat the koftas in the gram flour and deep fry them in medium hot oil until golden brown. Let the fried koftas cool down. Finely chop onions. Puree tomatoes, 1 tsp ginger garlic paste and red chillies to a fine paste. Add little water if required. If red chillies are not available, use Kashmiri Lal mirch powder for color and cayenne pepper for heat. Heat a kadhai/wok and add 1 tbsp oil. Add onions and saute until onions soften. Add tomato puree and cook until it thickens. Add 1/2 tsp coriander powder, 1/2 tsp cumin powder, 1/2 tsp chat masala and 1/4 tsp garam masala. Saute for another minute and add bottlegourd water. Cook it covered and bring it to boil. Add yogurt, salt to taste and bring it to a boil. Just before serving, add koftas to the sauce. Cook it covered and bring it to a boil. Garnish with cilantro leaves and serve with roti or naan. perfectly shaped koftas. looks yum!! Looks fantastic and so very inviting !! i make this curry often but without curd. liked the way you have presented the koftas in the gravy.